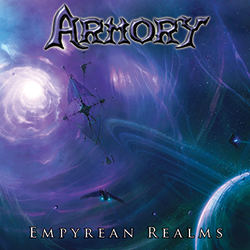 Armory to play Warriors of Metal Fest VII in Ohio, USA on June 27, 2014. Warriors of Metal Fest has become one of the most heralded melodic metal festivals in the United States. This year’s festival is at O’Sheckeys Live Bar & Grill in Columbus, Ohio on Thursday June 26, Friday June 27, and Saturday June 28. There will be over thirty bands performing in three days and feature the likes of Cellador, Aska, Steel Assassin, and Helstar, among many other quality bands. Armory’s set time is expected to be 5:35pm to 6:25pm on Friday June 27, which is right after Cellador performs. We will be playing a mix of songs from our debut album, The Dawn of Enlightenment, and our new album, Empyrean Realms. We will also be selling all of our merch at the festival, including CDs, tee-shirts, posters, and stickers, with combo deals available. Don’t forget, all merch is always available at the Armory Store right on our Official Website. For more details about the festival please go to the Warriors of Metal Official Facebook Page and for more details about the venue please go to O’Sheckys Live Facebook Page. We hope to meet every Armory fan that is able to make it out to this festival and support true heavy metal!